Looking for ways to boost prebiotics in your diet without FODMAPs? Try this delicious potato salad! Cooking then cooling the potatoes overnight increases their resistant starch (prebiotic) content, keeping your gut bacteria happy without increasing IBS symptoms. With the festive season fast approaching, why not include this simple salad as a low FODMAP side on Christmas day! Slice potatoes in half or quarters (depending on size) and place in a large pot. Cover with cold water and bring to a boil. Turn down the heat to a slow boil and cook for 12 to 15 minutes - until fork tender. Drain and set aside to cool (ideally refrigerate overnight). Trim green bean ends and cut green beans in half. Steam/boil green beans for 3-4 minutes until just tender. Drain and set aside to cool. Cook bacon in a small frying pan until crisp. Drain on paper towel to remove any excess fat. Prepare vinaigrette by whisking together olive oil, balsamic vinegar, mustards and black pepper. Finely slice chives and parsley and set aside. 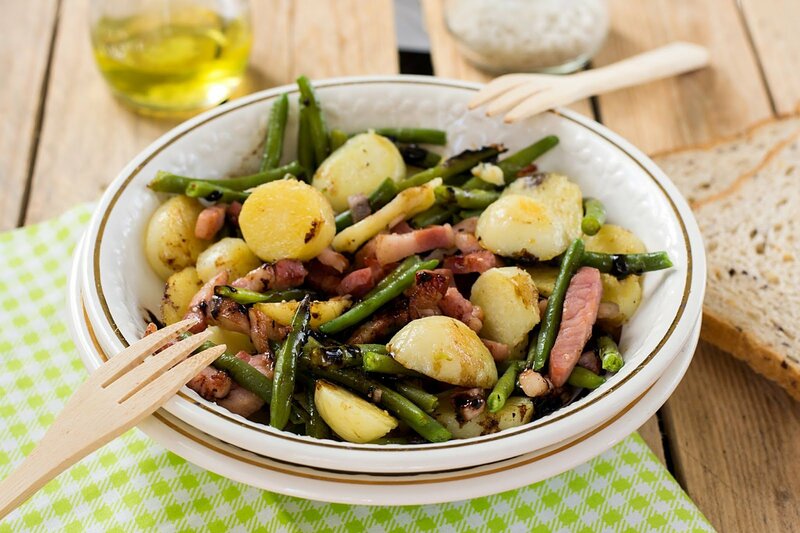 In a large salad bowl combine potatoes, green beans, bacon, chives, parsley and walnuts. Dress salad with vinaigrette and toss to coat evenly. Refrigerate salad until ready to serve.